Brandywine Ballet Company, West Chester, PA. The Brandywine Valley, quite frankly, is known for its daylight attractions and not its night life. However, there are options for those looking for entertainment after dark. Below some of the A&E venues in the area listed with links to their Web sites. For art museums, click to Attractions. For art galleries, click to Galleries. A Cappella Pops is the premier mixed voice a cappella vocal group in southeast Pennsylvania. Formed in 2001 and based in West Chester PA, they perform regularly in the region. Over the years, they have sung at the World Cafe, Longwood Gardens, the White House, Carnegie Hall, and in New Zealand. Pops repertoire is highly varied, ranging from American Songbook classics to jazz and contemporary songs. For more information and upcoming performances, go to acappellapops.com. 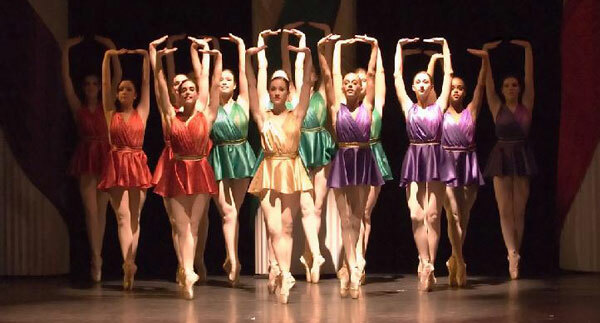 The Brandywine Ballet Theatre brings the best of innovative contemporary choreography and classic ballet repertoire to the Chester County Stage in its home at the Emilie K. Asplundh Concert Hall in the Philips Memorial Building on the campus of West Chester University. The company presents three full performance series a year and maintains a growing repertoire enriched annually by the inclusion of new works by recognized choreographers. Located in historic Ardentown, Delaware (45 minutes from Philadelphia), Candlelight Music Dinner Theatre combines fine dining with superb musical theatre entertainment. It is Delaware's first dinner theatre. Shows and events are listed online. Reservations online as well. The DCT's goal is to produce quality theatre for the young and family audience, and to provide training in Theatre Arts. The company is housed in the former New Century Club, an historic TheatreHouse in Wilmington. You can review the season's offerings and order tickets online. The DCCA at 35,000 sq. ft., houses seven galleries, 26 artists' studios, a gift shop, high-tech auditorium, and a classroom. On the rejuvenated Wilmington Riverfront, DCCA presents over thirty exhibitions annually of regionally, nationally and internationally recognized artists. The DSO performs at several venues in Delaware including the Grand Opera House and Hotel DuPont in Wilmington, the University of Delaware in Newark, DE and more. A professional regional theater company, presents an annual season of contemporary and classic comedies, dramas and musicals in their own Wilmington theater on the Christina riverfront. A core of classically trained Russian dancers augmented by visiting artists, performs classical and contemporary ballet at a variety of local venues. A magnificently restored 1871 Victorian showplace that has hosted acts ranging from the Neville Brothers, James Whitmore in Will Roger' U.S.A. to symphonies, theater troupes and dance, ballet and opera companies. The Grand also serves as home to the fully professional Delaware Symphony Orchestra, which presents a yearly season of classical, chamber and pops concerts, and to Opera Delaware, which offers classic, full-length operas and original commissions as well as a family-friendly Family Opera Theatre. An intimate 100 seat entertainment venue for rock, folk, blues, R&B, pop and comic performers. The Kennett Symphony of Chester County is Chester County's only professional orchestra. The orchestra performs at the Longwood Gardens Open Air Theatre and other area venues. A new art film theatre in downtown Wilmington, the first in more than 40 years is located on the first floor of a 14-story building that used to be owned by the DuPont Company. Theatre N is operated by the City of Wilmington show independent and foreign films on Friday and Saturday night. Tickets at the Box Office, 7-8PM night of, or buy online. "Wilmington's Little Broadway" presents an annual season of touring Broadway shows, from dramas and comedies to full-scale musicals. The cast uses Wilmington as a tune-up for New York and you are the beneficiary. The Resident Theatre Company or RTC, is a professional company that produces musicals and plays using Philly and NY actors and designers, Children's Theatre with adult casts, as well as at local schools as part of our outreach program. Main Stage shows are performed at The Uptown! Knauer Performing Arts Center, the reinvented the old Armory Building in Downtown West Chester located in at 226 North High Street. For ticketing questions call the theatre box office at: 610.356.2787. The WCU Live! series presents the best of touring international artists in a variety of performances ranging from dance, music and theatre as well as family productions. Performances are held in the Emilie K. Asplundh Concert Hall, located in the Philips Memorial Building on the corner of High Street and University Avenue, or the Madeleine Wing Adler Theatre, located in the Swope Music Building at the corner of High Street and Rosedale Avenue. The Wilmington Drama League traces back to 1933, when plays were staged on the third floor of an old grist mall at 18th and Market Streets. Today the Drama League stages productions at its own facility. See this years season listed online. Located in the completely refurbished Queen Theater, the venue operates on two levels: Upstairs Live: A casual restaurant & bar with an intimate live music stage. Downstairs Live: A spectacular live music space with full kitchen & bar. Both rooms feature clear sightlines, pristine acoustics, comfortable seating and live performances by outstanding artists from across the musical spectrum.